Our Fruit & Nut Granola is a mouth-watering mix of toasted oats, juicy jumbo raisins, chunks of hazelnuts, crunchy pecans and delicate almond flakes. To give you extra fibre goodness we've added sunflower seeds and flaxseed. 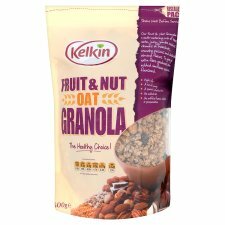 Kelkin Fruit & Nut Oat Granola is made in Ireland, using only the finest quality ingredients which have been carefully selected from around the world. To create our Fruit & Nut recipe we selected a range of premium quality nuts and combined them with toasted oats, jumbo raisins, sunflower seeds and flaxseed, creating a mouth-watering, wholesome breakfast cereal. Every spoonful is full of taste and texture! The healthiest way to enjoy our Fruit & Nut Oat Granola is with fresh, low fat milk, soya milk or probiotic yogurt. Oats are low in fat, high in fibre and slowly release energy to keep you feeling full for longer. Raisins contain iron and are a good source of dietary fibre. Nuts are a great source of protein, fibre, essential fatty acids, vitamin E - an antioxidant and minerals such as zinc, calcium, potassium, iron and magnesium. Seeds are a good source of dietary fibre, essential fatty acids, vitamin E, B vitamins and minerals such as selenium, zinc and iron. Kelkin have been providing wholesome, natural and healthy foods for you and your family since 1976. Our traditional values, strict dedication to quality and a passion for innovation ensure that Kelkin remains to this day, the healthy choice for you and your family. At Kelkin, we are committed to producing healthier food options to enable you and your family to lead fuller lives. Make Kelkin your Healthy Choice! Not suitable for small children who may choke on nuts. If you are not entirely satisfied with this product please return it to us at the address provided stating place and date of purchase. Your statutory rights are not affected. Store in a cool, dry, odour free place. To retain freshness, use ziplock once opened.